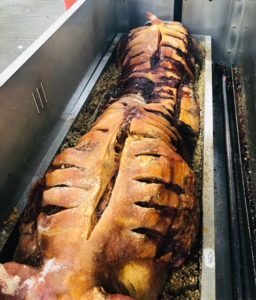 Hog Roast Danbury cater at any and all events whether that’s a wedding, birthday, funeral or even a corporate event, we will be on hand to provide delicious food for you and all of your guests. This week was another jam-packed week for Hog Roast Danbury. We began with catering for a local school reunion in Danbury. Students from the class of 1989 had gathered for a reunion after thirty years of completing high school. Susan, who had organised the gathering was head girl at the time and told us when she made the booking how excited she was to see everyone after so many years and find out what everyone had been up to. She also mentioned it was imperative the catering was of the top quality as the school had in the past had notoriously bad school dinners, so she wanted to reminisce on that by drawing a contrast with our delicious Hog Roast Danbury food. We assured her we would be out to impress and planned a menu that encompassed our signature Hog Roast Danbury rolls. These rolls consist of our slow roasted hog meat sandwiched between freshly baked rolls and lots of crispy crackling. This is then topped with our homemade apple sauce and lots of sage and onion stuffing to complete the perfect Hog Roast Danbury roll. We also brought along some gluten-free bread rolls and vegetarian and vegan alternatives that there would be something suited to everyone’s requirements. By the time the guests began to arrive at the school, Susan was busy mingling and saying hello to everyone. We had set up our stand in the main assembly hall and were happy to see a steady stream of people pick up one of our Hog Roast Danbury rolls and tell us they would most certainly be back for more, which we love to hear! As the guests mingled and chatted, we began to discretely pack away once everyone had gotten their Hog Roast Danbury fill. What a lovely event and we hope to be back again in another 10 years for the next reunion!